A leather shield would be of value to a barbarian, being light-weight and easy to use. While these describe the shield that Conan used, they leave out the detail found on our Conan the Barbarian Leather Round Shield by Marto. This superb replica is a licensed reproduction of the shield used in the original movie, Conan the Barbarian, as well as an excellent example of the type of shield that would have been popular for numerous reasons. 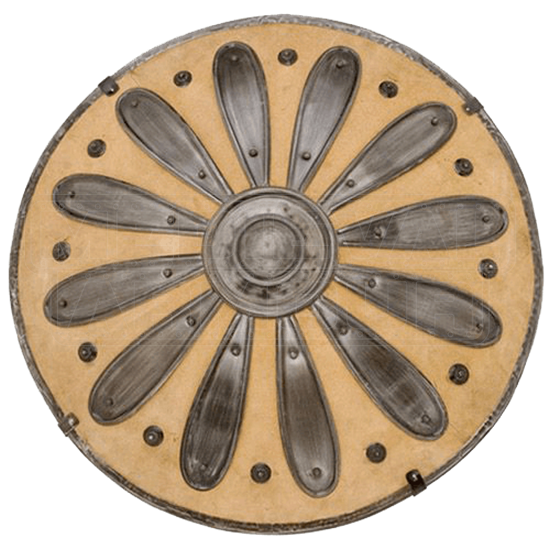 Constructed from leather and metal, this shield sports a pattern that features a central boss, from which several leaf-like rays spring, reaching out from the center of the shield to the edge. It is like both a sunburst pattern and a floral pattern. The Conan the Barbarian Leather Round Shield by Marto may not be the strongest shield in existence, but for its strength, it gets the job done perfectly well and that is what matters the most in a shield.